Off Topic: King Arthur's Round Table Discovered? King Arthur's Round Table Discovered?, The Telegraph, 26 Aug 2011. King Arthur's round table may have been found by archaeologists in Scotland. Archaeologists searching for King Arthur's round table have found a "circular feature" beneath the historic King's Knot in Stirling. 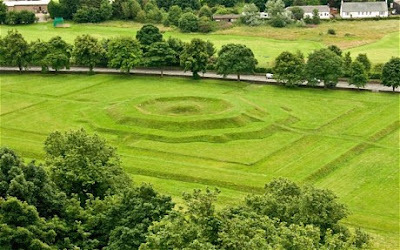 The King's Knot, a geometrical earthwork in the former royal gardens below Stirling Castle, has been shrouded in mystery for hundreds of years. Though the Knot as it appears today dates from the 1620s, its flat-topped central mound is thought to be much older. Writers going back more than six centuries have linked the landmark to the legend of King Arthur. Archaeologists from Glasgow University, working with the Stirling Local History Society and Stirling Field and Archaeological Society, conducted the first ever non-invasive survey of the site in May and June in a bid to uncover some of its secrets. Their findings were show there was indeed a round feature on the site that pre-dates the visible earthworks. Historian John Harrison, chair of the SLHS, who initiated the project, said: "Archaeologists using remote-sensing geophysics, have located remains of a circular ditch and other earth works beneath the King's Knot. "The finds show that the present mound was created on an older site and throws new light on a tradition that King Arthur's Round Table was located in this vicinity." Stories have been told about the curious geometrical mound for hundreds of years -- including that it was the Round Table where King Arthur gathered his knights. Around 1375 the Scots poet John Barbour said that "the round table" was south of Stirling Castle, and in 1478 William of Worcester told how "King Arthur kept the Round Table at Stirling Castle". Sir David Lindsay, the 16th century Scottish writer, added to the legend in 1529 when he said that Stirling Castle was home of the "Chapell-royall, park, and Tabyll Round". It has also been suggested the site is partly Iron Age or medieval, or was used as a Roman fort. Extensive work on the royal gardens was carried out in the early 17th century for Charles I, when the mound is thought to have taken its current form. The first known record of the site being called the King's Knot is from 1767, by which time it was being leased for pasture. Locals refer to the grassy earthworks as the "cup and saucer", but aerial photographs taken in 1980 showed three concentric ditches beneath and around the King's Knot mound, suggesting an earthwork monument had preceded it. The new survey -- funded by Historic Scotland and Stirling City Heritage Trust -- used the latest scientific techniques to showing lost structures and features up to a metre below the ground. It also revealed a series of ditches south of the main mound, as well as remains of buildings, and more recent structures, including modern drains which appear at the northern end of the gardens. Mr Harrison, who has studied the King's Knot for 20 years, said: "It is a mystery which the documents cannot solve, but geophysics has given us new insights. "Of course, we cannot say that King Arthur was there, but the feature which surrounds the core of the Knot could explain the stories and beliefs that people held." Archaeologist Stephen Digney, who coordinated the project, said: "The area around Stirling Castle holds some of the finest medieval landscapes in Europe. "This investigation is an exciting first step in a serious effort to explore, explain and interpret them. The results so far suggest that Scotland's monarchs integrated an ancient feature into their garden, something we know happened in other countries too. "We are looking forward to the next stage in September when we hope to refine some of the details." Dr. Kirsty Owen, Cultural Heritage Adviser at Historic Scotland, added: "The project has the potential to add to our knowledge of the landscape context of the medieval and early modern occupation of Stirling Castle. 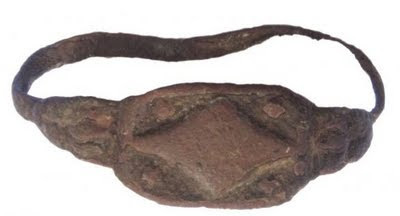 "The ditches identified may intriguingly be part of historically documented earlier garden features, or if prehistoric in origin could add to our scant knowledge of prehistoric activity at Stirling Castle. "We look forward to seeing the results of the next phase of investigations." Futher work including a ground-penetrating radar survey, is now planned to take place next month to find out more. A small display of the interim results can be seen close to the site at the Smith Museum. CWL: Wha d'ya know? It's an Eastern Woodlands Indian Mound! 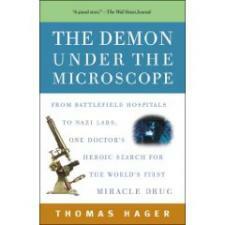 The Demon Under The Microscope: From Battlefields Hospitals to Nazi Labs, Thomas Hager, Broadway Publishing, 352 pages, bibliography, index, source notes, paperback, $15.00. Thomas Hager opens Demon Under The Microscope with compelling descriptions of December 7 1941's wounded and those who cared for them. The setting is Tripler General Hospital in Hawaii. Ambulances, trucks, and cars bring the torn, the lacerated, and the roasted to the hospital. When it is filled the lawns of the facility are covered with the injured. The hospital's three operating rooms are in service for nearly a full day. Surprisingly and quite unlike World War One, there is not a single death from infection. In the first three chapters, Hager weaves stories of battlefield medicine from before the French Revolution through World War One. The science of bacteriology began immediately before and during the First World War in which soldiers living in earthworks and trenches could die and without being wounded. 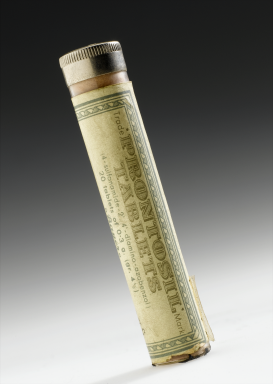 It was a world without antibiotics. In Germany, Gerhard Domagk and his colleagues at Bayer Corporation worked constantly to identify which microscopic bacteria that caused tuberculosis, malaria, and blood poisoning. Discovered in 1932, sulfa became the first of the modern. Hager addresses the biology and chemistry of the discovery through the competitive personalities, the national environments, the aggressive international marketplace. Patent wars, lawsuits, dying children of U.S. Presidents, a nearly dead Winston Churchill after the Teheran Conference move the store forward. Research chemists, laboratory mice, and fortunate and unfortunate accidents may be mundane, but not when the Nazi's are looking over shoulders and monitoring research labs. Nazi chieftan Reinhard Heydrich is wounded by Czech assassins and, due to a possible misuse of sulfa, dies. To find out if sulfa was the cause, Ravenbruck concentration camp's laboratory conducts infection and sulfa studies on women prisoners. For those who have seen Saving Private Ryan, recall the episode where the medic is wounded in the assault on the Nazi communication post. His wound was dusted with white powder, a sulfa drug. Demon Under the Microscope is a well paced, personality driven suspense story of scientific discovery. There are no photographs in the books; it would have been enhanced with portraits of the main characters. On the other hand, your mind supplies the visuals from Hager's descriptions. Summer Thunder: A Battlefield Guide To The Artillery At Gettysburg, Matt Spruill, University of Tennessee Press, 338 pp., 60 b/w photographs, 74 maps, 5 appendices, 2010, $29.95. Matt Spruill, author of four Civil War battlefield guides, brings his teaching experience at the U.S. Army General Command and Staff College and the U.S. Army War College to bear upon the Gettysburg battlefield. His 2011 Decisions at Gettysburg: The Nineteen Critical Decisions That Defined the Campaign may be among this year's best books on the Battle of Gettysburg. Summer Thunder is one of a kind. Students of the Battle of Gettysburg are well served by Bradley Gottfried's The Artillery of Gettysburg and Spruill's book is also valued resource for is visitors to the national military park. Summer Thunder uniqueness lies in a 'boots on the ground' approach. Many guide books take the user on a two hour tour with July 2 and July 3 cover in one stop. Spruill's tour is thorough with 35 stops many of which have three and even four segments once the user get out of the car. July 1, July 2, and July 3 engagements are distinct on the tour. The armies’ deployment of artillery from one position to another, from one day to the next is carefully described. Matt Spruill, a retired U.S. Army colonel and former Gettysburg Battlefield Licensed Guide, offers readers succinct segments of the artillerists' and infantry commanders' reports found in the Offical Records and in their postwar writings. The tactical thinking of of the cannoneers is revealed and their voices are clear and precise in Summer Thunder. Spruill has chosen 35 locations with complete with driving instructions, recent photographs, and uncluttered maps that depict the battlefield as it was in 1863. The artillery positions are marked and includes the number of guns in action with each battery. The passages from primary sources reveal the participants understandings of the event. Gregory Coco's A Concise Guide to the Artillery at Gettysburg is among the best short consideration of the topic. Spruill's is quite similar regarding the various artillery pieces and ammunition used by both armies. What makes Summer Thunder distinctive is the constant attention Spruill to the distance in yards between the tour stop and the distant targets and the ability of some pieces to reach further than others. 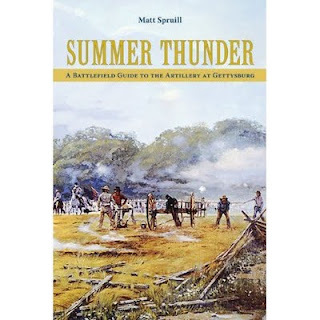 For frequent visitors to the battlefield or those who attend the anniversary battle walks hosted by the National Park Service, Summer Thunder is so descriptive that the mind's eye can visual from the text the view Spruill describes. Well illustrated with portraits of the commanders and present day views of the terrain, the book's text is supported by appropriate visuals. Several but not all the maps have topographic lines. Thankfully, the farm buildings, those still standing and those lost to time, are on the maps. Small disappointments in Summer Thunder include the omission of the Pennsylvania Reserves assault and capture of Houck's Ridge and the clearing of the Wheatfield after the Grand Assault. Also, the cavalry battles of July 3 are not covered. The July 2 artillery duel between the Federals East Cemetery Hill, McKnight's Knoll and Culp's Hill and the Confederates on Benner's Hill is addressed in an appendix. Summer Thunder is of value for all who read at least one Gettysburg book in a year, who travel there anytime, who reenact Civil War artillery, who take the Licensed Battlefield Guide Examine or those who members of the Order of Saint Barbara, a military honor society of the field artillery and the air defense units of the United States Army and the United States Marine Corps. Saint Barbara's Day is December 4. 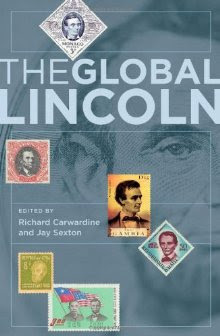 The Global Lincoln, Richard Carwardine and Jay Sexton, Oxford University Press, 344 pages, hardcover, $29.95. From the Publisher: Perhaps more than any other American, Abraham Lincoln has become a global figure, one who spoke--and continues to speak--to people across the world. Karl Marx judged Lincoln "the single-minded son of the working class"; Tolstoy reported his fame in the Caucasus; Tomas Masaryk, the first president of Czechoslovakia, drew strength as "the Lincoln of Central Europe"; racially-mixed, republican "Lincoln brigades" fought in the Spanish Civil War; and, more recently, statesmen ranging from Gordon Brown to Pervez Musharraf to Barack Obama have invoked Lincoln in support of their respective agendas. This fascinating volume brings together leading historians from around the world to explore Lincoln's international legacy. The authors examine the meaning and image of Lincoln in many places and across continents, ranging from Germany to Japan, India to Ireland, Africa and Asia to Argentina and the American South. The book reveals that at the heart of Lincoln's global celebrity were his political principles, his record of successful executive leadership in wartime, his role as the "Great Emancipator," and his resolute defense of popular government. Yet the "Global Lincoln" has been a malleable and protean figure, one who is forever being redefined to meet the needs of those who invoke him. The first study of Lincoln's global legacy, this book tells the unknown and remarkable story of the world-wide impact of one of America's great presidents. From an Amazon.com review: This book, like all such academic collections, varies in quality given the range of writers and specific topics discussed. It is a great help that one of its two British editors is the noted Lincoln biographer, Professor Richard Carwardine. A general reader, holding a decent prior level of knowledge about Abraham Lincoln, a keen interest in this great man and an interest in world affairs, will likely find this volume quite rewarding. 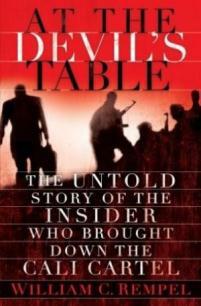 At The Devil's Table: The Untold Story of the Insider Who Brought Down the Cali Cartel, Willima C. Rempel, Random House, 368 pages, $27.00. CWL: This book delivers everything the cover flaps states. There are times when the reader wonders how will the informant, his wife and children make it out alive. An honest man with a job that takes a crooked turn. Thug life in Columbia. A war between to narco-families, one family from Medellin and and the other from Cali. When one extended family is hunted down, put in prison or killed another war begins. The Cali Cartel vs. the Columbian government is a shudder-inducing story. With the U.S. help, both families are taken down. The British and Dutch narco-mercenaries get back to Europe and retire. Martin Scorcese should by the film rights to this book. Cover Flaps: In this riveting and relentless nonfiction thriller, award-winning investigative reporter William C. Rempel tells the harrowing story of former Cali cartel insider Jorge Salcedo, an ordinary man facing an extraordinary dilemma—a man forced to risk everything to escape the powerful and treacherous Cali crime syndicate. Colombia in the 1990s is a country in chaos, as a weak government battles guerrilla movements and narco-traffickers, including the notorious Pablo Escobar and his rivals in the Cali cartel. Enter Jorge Salcedo, a part-time soldier, a gifted engineer, a respected businessman and family man—and a man who despises Pablo Escobar for patriotic and deeply personal reasons. He is introduced to the godfathers of the Cali cartel, who are at war with Escobar and desperately want their foe dead. With mixed feelings, Jorge agrees to help them. Once inside, Jorge rises to become head of security for Miguel Rodríguez Orejuela, principal godfather of the $7-billion-a-year Cali drug cartel. Jorge tries to turn a blind eye to the violence, corruption, and brutality that surround him, and he struggles privately to preserve his integrity even as he is drawn deeper into the web of cartel operations. Then comes an order from the godfathers that he can’t obey—but can’t refuse. Jorge realizes that his only way out is to bring down the biggest, richest crime syndicate of all time. William C. Rempel is the only reporter with access to this story and to Jorge, who remains in hiding somewhere in the United States—even the author doesn’t know where—but has revealed his experience in gripping detail. Salcedo’s is the story of one extraordinary ordinary man forced to risk everything to end a nightmare of his own making. More Artifacts Discovered At Lost Civil War Site, Rob Pavey, Augusta Chronicle, August 18, 2011. Camp Lawton near Millen, Ga., is yielding clues to soldiers' lives. Archaeologists now have more than buried artifacts to piece together the story of Camp Lawton, where Union prisoners were housed in the final weeks of the Civil War. “We have an actual letter, sent by a prisoner to his family back in the North,” said Georgia Southern University archeologist Kevin Chapman. Image Caption: A copper ring with an elongated diamond emblem believed to represent the Union’s Army 3rd Corps. It was among new artifacts shown today from the site of Camp Lawton, a Confederate prison camp in Jenkins County where more than 10,000 captured Union soldiers were held in the closing weeks of the Civil War. 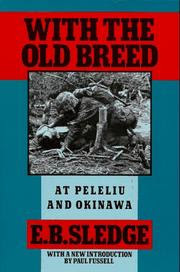 With The Old Breed At Peleliu and Okinawa, E. B. Sledge, Presidio Press; 352 pages, paperback, $16.00. With the Old Breed: At Peleliu and Okinawa is a United States Marine's World War II Pacific Theater memoir. Eugene Sledge first published his memorior in 1981. With the Old Breed along with A Helmut For My Pillow by Robert Leckie, has been recognized as being among the best first-hand accounts of combat in the Pacific. Sledge, in a pocket-sized New Testament he carried with him during battles, kept a diary. In 1944 Sledge began making personal notes after Peleliu while in a rest camp on Pavuvu Island. As a 60 millimeter mortar man in K Company, 3rd Battalion, 5th Marines, 1st Marine Division Sledge experienced combat during the battles of Peleliu and Okinawa. After completing a re-working of his diary, With the Old Breed was published in 1981 and has gone through ten other printings in the U.S., U.K., Japan and Thailand. Sledge presents details of the utterly exhausting struggle of fighting and living living in a tropical battlefield: perpetual fear, fatigue, and filth. Marines could not stay dry, could not dig latrines in Okinawa's mud or Peleliu's coral, could not sleep. While digging a fox hole, Sledge found graves; he protested to the sergeant who ordered him to continue. Sledge continued to complain until a captain ordered him to move the hole three feet to one side. Instances of mutilations on the battlefields are a part of Sledge's memories. With a buddy, he discovered the mutilated bodies of three Marines, one of which had been sexually mutilated. He does not neglect the behavior of some Marines towards dead Japanese, such as the removal of gold teeth from Japanese corpses. The descriptions of receiving several night time "banzai" or frontal assaults are horrific. The brutality displayed by American and Japanese soldiers and the hatred that each for each other is described on the personal level. This is contrasted with Sledge's childhood and youth. 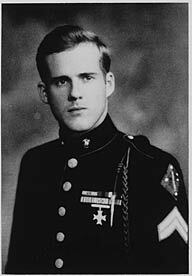 Born in 1923 in Mobile, Alabama Eugene Sledge was the descendant of Confederate officers. A frail child and avid reader, his physician father brought him up in the out-of-doors. Fishing and hunting, he came to love adventures the woods. Rheumatic fever and then a rheumatic heart murmur kept him out of the Marines until he graduated from high school in May 1942 and entered Marion Military Institute in the fall. In December 1942, he left the academy for the Marine Corps. The Alabamian entered officer training program and was sent to Georgia Tech. He intentionally failed his exams in order to become an enlisted Marine. Sledge survived the islands and was stationed in China until 1946. He returned to Alabama and attended Auburn University where he began his career in helminthology, which is the study parasitic worms. At the behest of his wife and children he dealt with his PSTD by reviewing his New Testament diary and producing With The Old Breed. Rich in the details of combat, weapons, buddies, the enemy and Marine life, Sledge's memoir leaves the reader with indelible images of the horrors of combat in the Pacific. It is ironic that Sledge's diary was kept along side the words of Jesus and Paul. CWL would love to study the original diary and see what Sledge wrote beside the Gospel of John, Chapters 15 through 17 in which Jesus teaches his disciples the night before his crucifixion. General Cleburne’s Proposal to Arm Slaves, David Seibert, Historical Marker Database, July 14, 2011. 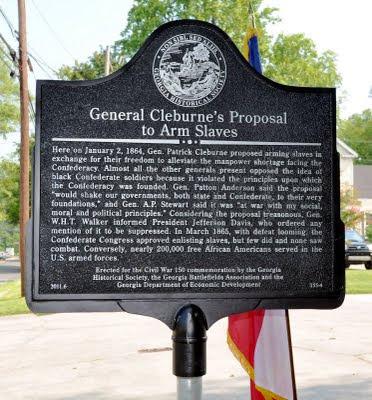 Inscription: Here on January 2, 1864, Gen. Patrick Cleburne proposed arming slaves in exchange for their freedom to alleviate the manpower shortage facing the Confederacy. Almost all the other generals present opposed the idea of black Confederate soldiers because it violated the principles upon which the Confederacy was founded. Gen. Patton Anderson said the proposal “would shake our governments, both state and Confederate, to their very foundations,” and Gen. A.P. Stewart said it was “at war with my social, moral and political principles.” Considering the proposal treasonous, Gen. W.H.T. Walker informed President Jefferson Davis, who ordered any mention of it to be suppressed. In March 1865, with defeat looming, the Confederate Congress approved enlisting slaves, but few did and none saw combat. Conversely, nearly 200,000 free African Americans served in the U.S. armed forces. Erected 2011 by the Georgia Historical Society, the Georgia Battlefields Association and the Georgia Department of Economic Development for the Civil War 150 commemoration. The marker stands in front of the Cook-Huff House, used by General Joseph Johnston as his headquarters in January 1864 while he planned his defenses for the campaign for Atlanta. Johnston was appointed to command the Army of the Tennessee in late December 1863. Marker is at or near this postal address: 314 North Selvidge Street, Dalton GA 30720. Historian Shelby Foote's widely quoted view that Forrest stood alongside Abraham Lincoln as one of the war's "two authentic geniuses" defines hyperbole. Forrest was an excellent cavalry officer who vexed Union forces in the Western Theater. His many admirers claimed he should have been given far greater responsibility, perhaps even army command. But Forrest lacked the administrative skills, temperament, and intellect to lead an army. Nothing in his record suggests he could have succeeded in operational or strategic planning and execution. Reynolds has often been described as the best corps chief in the Union's Army of the Potomac, a gifted officer who turned down command of the republic's largest force on the eve of Gettysburg. But he exemplifies the phenomenon of reputations inflated by death in dramatic circumstances. Prior to Gettysburg, he led the I Corps at Fredericksburg and Chancellorsville, in neither instance distinguishing himself. The shot that killed him on the morning of July 1, 1863, as he rode toward the fighting along McPherson's Ridge, elevated him to the status of martyred hero—and sparked untold speculation about what might have been. Johnston appeals to those who believe Robert E. Lee too often pursued bloody offensives. Frequently compared to the great Roman general Fabius Maximus, he has been lauded as one who understood that masterful retreats and defensive thinking best suited the Confederacy's needs. Yet his retreats in Virginia and Georgia demoralized the South, while his logistical blundering after First Bull Run, clumsy offensive on the Peninsula in May 1862, and pathological concern with rank and privilege all harmed the cause. Few figures from the Civil War have inspired more romantic adulation than Mosby, whose battalion of partisan rangers operated in the Shenandoah Valley and elsewhere in northern Virginia. The Gray Ghost's own postwar writings helped burnish his reputation, leaving no deed unmentioned and undoubtedly persuading 20th-century television producers to create a series based on his exploits. Yet Mosby's attacks on supply trains and other activities, though annoying to Union commanders, did nothing to shape the larger outcome of the war in Virginia. Chamberlain, commanding his 20th Maine Infantry, was one of many Union colonels who led their units with distinction at Gettysburg, and he compiled a splendid record in later campaigns. He remained largely forgotten until Michael Shaara's book The Killer Angels and Ken Burns's documentary The Civil War sent his stock soaring. By the mid-1990s, his reputation outshone that of all Union officers except Ulysses S. Grant and perhaps William Tecumseh Sherman. The "Hero of Little Round Top," as he came to be known, surely deserves to be remembered—but only as one among many. 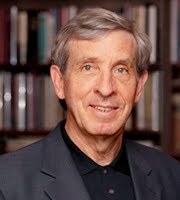 Gary W. Gallagher, a professor of history at the University of Virginia, is the author of The Confederate War (1997), Lee and His Army in Confederate History (2001), and The Union War (2011). CWL: The comments left in response to this list are interesting to read. Several defenses of Mosby and Forrest, none of Johnston. And no responses regarding Reynolds or Chamberlain. There is a good response regarding the work of an historian and the evaluations of an enthusiast. One response was a declaration of from New Zealand: "What a load of rubbish. Even myself as an amateur historian can see through this attempt to have a go at the Confederate historians. I would prefer to read honest articles from good historians than to read something of an agenda that this article is. Note to self. Dont read any of Gary Callagher's books." CWL's response to this comment was: "You should read Gallagher's 'The Confederate War'. I bet you'll find very little to disagree with between the covers. Also, check out The Teaching Company's lecture series on 'Robert E. Lee and His Lieutenants' taught by Gallagher. Gallagher is very complimentary to Lee and his staff. 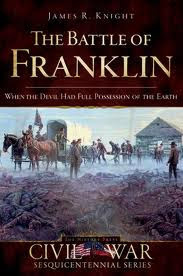 The Battle of Franklin: When The Devil Had Full Possession of the Earth, James R. Knight, The History Press, 158 pp., 38 b/w illustrations, 6 maps, notes, appendix, Fifth Printing 2011, $19.99. The History Press well serves the local, regional and state book markets. In the publisher's Civil War Sesquicentennial Series each book is a concise, illustrated history of an epic battle, a critical turning point, a pivotal campaign or an important city. The authors are respected Civil War scholars and regional historians who offer their research in crisply written, well illustrated and suitably mapped volumes. James R. Knight has offered two in this series; one on Fort Donelson and one on the Battle of Franklin. Both are fine examples of clear and complete within the series that has a 200 page, or there about, limit. A few weeks ago, CWL reviewed Fort Donelson: No Terms But Unconditional Surrender. Franklin's battlefield is in the process of recovery from development. The Carter House is now a National Historic Landmark located on the field of the 1864 Battle of Franklin. The house serves as the interpretive center for the battle and features a museum and guided tours. Following the bloody battle on November 30, 1864, wounded soldiers were treated at the Carnton Plantation with its antebellum mansion. Probably four or more Confederate generals were laid out on its back porch. Nearby is the McGavock cemetery, one of the largest Confederate graveyards in the nation. Both of these sites were featured in Robert Hicks' bestselling novel The Widow of the South. 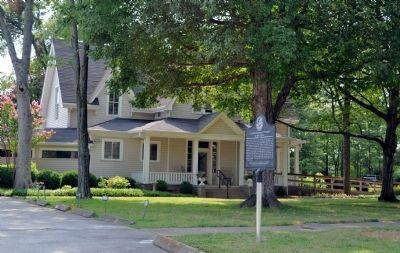 The Lotz House Museum features artifacts and antiques from the Battle of Franklin, the Civil War, and frontier Tennessee. Organized in 2005, Franklin’s Charge is an organization dedicated to preserving Civil War battlefields in Williamson County, Tennessee, and to educating the public about Civil War events occurring in Middle Tennessee. One of its goals is to bring together all preservation groups operating in Williamson County. James Knight's The Battle of Franklin is in part evidence that the citizens of Franklin and their neighbors have been successful their preservation efforts. In late November 1864, the last mobile Southern army east of the Mississippi started out from northern Alabama on the Confederacy’s last offensive. Army of Tennessee and John Bell Hood, its commander, set out to capture Nashville and then march on to the Ohio River. A small Union force, commanded by John Schofield, slipped by at Spring Hill and faced Hood's army at Franklin. In a desperate attempt to smash John Schofield’s line at Franklin, Hood threw most men against the Federals' field fortifications the center of which as on the Carter house and its cotton gin. With reports from the Official Records, letters and diary entries from the Carter House Archives, middle Tennessee historian James R. Knight paints a vivid portrait of leaders and enlisted men. Knight addresses what can be known of the battle and the questions are left unanswered. The questions of Hood punishing the army for its failure at Spring Hill, the likelyhood of Hood of being over medicated for wounds, and just how many dead Rebel generals were on the Carnton house front porch are reasonably answered by the author. Knight recovers the story of the civilians during the battle and their attempt to live after a battle which heavily damaged their property and filled their yards and fields with the dead and dying. He handles Hood's campaign strategy well and the army's path to middle Tennessee, the event at Spring Hill and John Schofield's mistakes and achievements during the retreat to Nashville. Federal and Confederate rank and file troops' testimony of the campaign is present in every chapter. Knight nicely concludes the book with a brief description of the demise of the Confederate army during and after the Battle of Nashville. Also, in an epilogue, Knight offers brief summaries of the commanders careers and lives after the battle and war. Knight's Fort Donelson and The Battle of Franklin are essential for visitors to the sites and for those are looking for accessible books on the turning points of the Civil War. Workers Find Civil War bullets In Gettysburg Tree: Park Maintenance Crews Make Historic Discovery, Tim Prudente, Evening Sun, August 9, 2011. A gnarled oak tree that had fallen on the Gettysburg battlefield was overlooked for years by visitors and park staff. Now, it's the center of attention after maintenance crews discovered two Civil War bullets lodged in the trunk. Last week, crews were cutting through the tree on Culp's Hill when a chain saw struck lead. "One hundred years ago it was commonplace to find bullets in Gettysburg trees but this is a rarity today," said Bob Kirby, superintendent of Gettysburg National Military Park. It was the first time in more than a decade that bullets have been found in a tree on the battlefield, according to park staff. 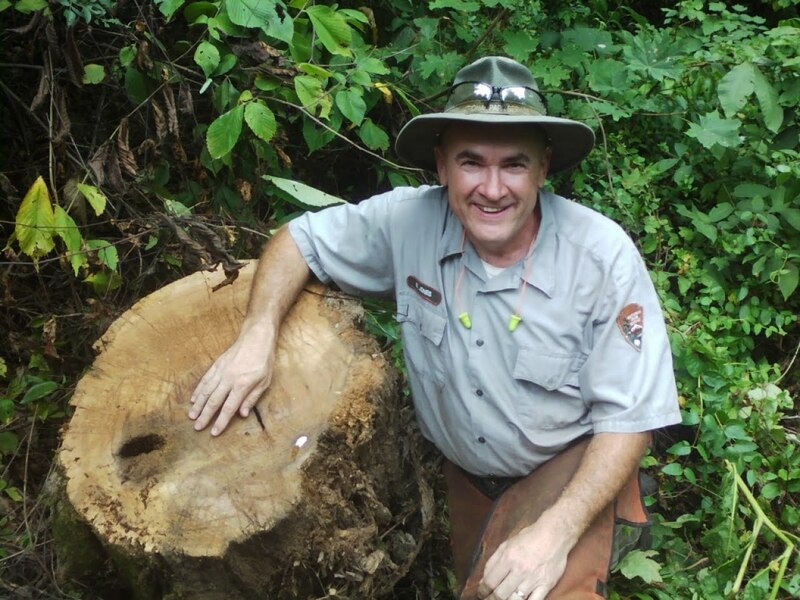 The discovery also proves the fallen oak tree witnessed the Battle of Gettysburg and an arborist has since identified the tree to be more than 200 years old. 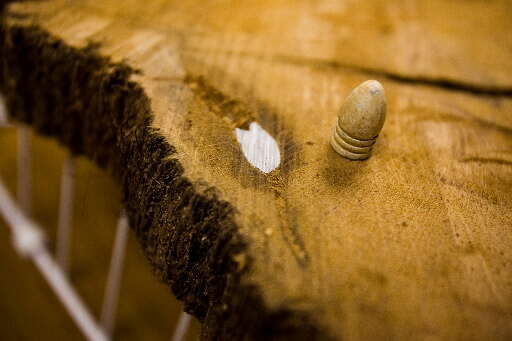 "Not only is the bullet an artifact but the tree is too," said Museum Specialist Paul Shevchuk. The discovery was made Thursday and one of the bullets is believed to be a 54 caliber, the other a 58 caliber. Crews were working to remove a section of the trunk that threatened a nearby marker. The rest of the fallen tree will remain on the east slope of the Culp's Hill summit, near the marker for Union Maj. Joshua Palmer. Two sections of the trunk containing the bullets were taken to the Museum and Visitor Center, where they will be frozen for three days and vacuumed to remove any insects or mold. Then, the sections will be stored alongside hundreds of similar sections of trees that have been found to contain bullets or shrapnel. Gettysburg National Military Park boasts a collection or more than 1.6 million relics, the world's largest, and likely most valuable, assortment of Civil War artifacts. Only about 2 percent of this collection is on display for the public, though. Staff only select artifacts for display that illustrate the story of the Civil War. t's not surprising the discovery was made on Culp's Hill, an area that saw some of the heaviest fighting during the Battle of Gettysburg. On the morning of July 3, Confederate forces launched the second of two attacks on Union troops occupying Culp's Hill. The Rebels, though, were ultimately repelled - after seven hours of fighting - largely due to an artillery bombardment from Union forces perched on Powers Hill. Soon after the battle, Culp's Hill became a popular picnic area for tourists who were intrigued by the bullet-riddled trees. Few of these trees survive today, though. Historians say most literally died from lead poisoning. Top Caption: A replica bullet is shown next to a Civil War slug found lodged in an oak tree on the Gettysburg battlefield. Crews discovered two historic bullets last week while working to clear trees from the summit of Culp s Hill. 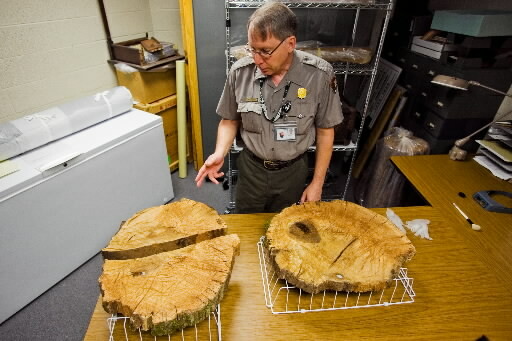 Bottom Caption: Gettysburg Museum Specialist Paul Shevchuk shows sections of an oak tree from the Gettysburg battlefield that contain bullet fragments from the Civil War. The artifacts were found last week when crews worked to cut a fallen tree on Culp s Hill. Text and Image Source: Evening Sun, August 9, 2011. 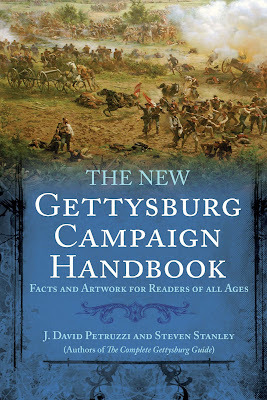 The New Gettysburg Campaign Handbook: June 9-July 14, 1863---Facts, Photos and Artwork for Readers of All Ages, J.David Petruzzi and Steven Stanley, Savas Beatie Publishing, 184 pp., numerous color and b/w photographs, 28 color maps, $18.95. Without a doubt, Savas Beatie LLC, kept to its high standard of quality with its offering The New Gettysburg Campaign Handbook: June 9-July 14, 1863---Facts, Photos and Artwork for Readers of All Ages. By condensing and reorganizing the prize winning The Complete Gettysburg Guide and adding some new information, J.David Petruzzi and Steven Stanley have created a book that is for readers of all ages. Even pre-readers will be entertained by using the book as a picture album. Having taught all grades from kindergarten through 12, with the exception of sixth grade, and by having raised five children, I could almost guarantee it. Any adult who is willing to have a small child sit on their lap and read to them and talk about the pictures, will be able to tell stories from this book. Also, anyone who is looking for their first book on the Battle of Gettysburg, would do well to start with The New Gettysburg Handbook. Lists of facts, questions with answers, black and white and color photographs, sketches and classic watercolor paintings are on every page. For the the authors offer the distance away from the battlefield on the evening of June 30, the organization of the armies, and photographs of the noteworthy commanders and men in the ranks. The weather conditions are briefly discussed as are the role of the civilians in the battle. Controversies, myths, misconceptions about the campaign and battle are addressed. Forty-one notable qoutations are listed, the Confederates are list in red and the Federals are listed in blue. The battle covers 75 of the books 189 pages. Two pages offer and discuss the Gettysburg Address. For visitors to the national battlefield park there is a list of webstites. Helpful for readers is a list of books organized in 19 categories. The organization of the armies [order of battle] is presented which makes the book handy for touring the battlefield and reading the monuments. 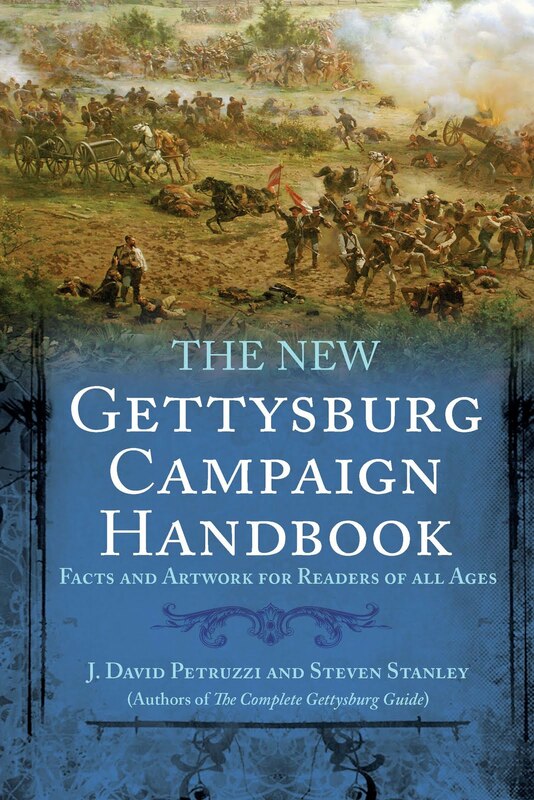 More than likely, first time visitors leaving the national park's bookstore will have The New Gettysburg Campaign Handbook: June 9-July 14, 1863---Facts, Photos and Artwork for Readers of All Ages in hand. There a few segments of the campaign that were missing from The Complete Gettysburg Guide that are also missing from The New Gettysburg Campaign Handbook. More attention than a single line should be used for the June 30 cavalry battle at Hanover. Imagine if Confederate horsemen were travelling west on the Hanover-Gettysburg Road on July 1. Also, the July 2 evening counter assault of Pennsylvania Reserve Division troops from the north slope of Little Round Top through Plum Run and to the east side of the Wheatfield should have been noted. After the July 3 Grand Assault, the Pennsylvania Reserve brigades again assaulted the Wheatfield and captured Georgia troops with their colors. The assault occurred along with Farnesworth's cavalry charge toward the Slyder Farm and Merrit's cavalry charge northward on the Emmittsburg Road. The cavalry charges are discussed and maps are presented; but the Pennsylvania Reserves assault is not mentioned and has no map. Though constrained by the 184 page limit adding a map and a caption would have been possible. Also, a brief history of the National Cemetery and the birth and growth of the Gettysburg National Military Park is not found between the covers. These omissions do not detract from The New Gettysburg Campaign Handbook: June 9-July 14, 1863---Facts, Photos and Artwork for Readers of All Ages. It is an enjoyable and informative handbook for all readers and travelers to the battlefield. All the Civil War national parks would be well served by the attention of Petruzzi and Stanley. Maintenance workers at the Gettysburg National Military Park cutting through a fallen oak tree have discovered bullets fired during the famed Civil War battle. The crews came across the bullets earlier this month, while working on Culp's Hill, which served as the right flank of the Union Army on July 1st, 2nd and 3rd in 1863. "Culp’s Hill is one of the areas on the Gettysburg battlefield that saw intense fighting in July 1863," says Park Superintendent Bob Kirby. "One hundred years ago it was commonplace to find bullets in Gettysburg trees but this is a rarity today." Two sections of the tree trunk where the bullets were found have been moved to the park's museum collections storage area. They will be treated to remove insects and mold and then added to the park's artifacts collection. According to the National Park Service, a number of witness trees on the battlefield have been frequently pointed out during battlefield tours. Other previously unknown Witness Trees are often identified during preparatory work for battlefield rehabilitation efforts, where the park re-opens historic meadows and farm fields to restore the historic integrity of the 1863 battlefield and to improve the visitors’ understanding of what happened during the clash between Union and Confederate forces. Two-Day Event On Private Land Near Boonsboro Will Mark 150th Anniversary Of Civil War Battles, Heather Kells, Hagerstown Herald Mail August 8, 2011. An estimated 4,000 Civil War re-enactors will stage a public re-enactment of the battles of South Mountain and Antietam on Sept. 8 and 9, 2012, on private land near Boonsboro, organizer Chris Anders said at a press conference Monday. 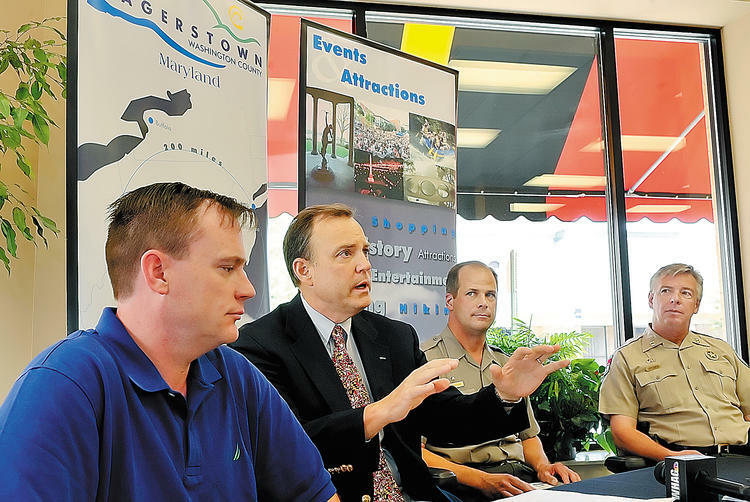 The event, called “Maryland, My Maryland,” is being staged by The Southern Division, an all-volunteer re-enactment organization, and will be sponsored by the Hagerstown-Washington County Convention and Visitors Bureau, Anders said. Re-enactment of the Battle of Harpers Ferry might also be included, he said. The event will be open to 2,000 spectators per day, and tickets will go on sale soon from the Convention and Visitors Bureau, he said. Tickets will cost $25 for one day or $40 for both days, CVB President Thomas B. Riford said. Those 6 and younger will be admitted free. All proceeds from the event will go to the Central Maryland Heritage League to help preserve and interpret South Mountain State Battlefield and to Brittany’s Hope Foundation, a charity that helps with the adoption of special-needs children worldwide, Anders said. The re-enactment will be held on about 100 acres of land at the foot of South Mountain near the intersection of Alt. U.S. 40 and Md. 67 east of Boonsboro. “We’re setting up the event to be a very authentic event so people get a true Civil War experience,” Anders said. Anders said he has organized about 20 re-enactments and is a partner in Rear Rank Productions, which specializes in coordinating logistical aspects of re-enactment events, such as water and signs. His caps of 4,000 to 5,000 re-enactors and 2,000 spectators mean the event will be considerably smaller than the Battle of Antietam re-enactments staged in 1997 and 2002, which each attracted about 13,000 re-enactors and as many as 100,000 spectators. Anders said smaller numbers will allow for higher authenticity and better views for spectators. “The goal is that people actually see what happened in September 1862, what the troops looked like, how they camped, how they fought, not a fantasy world-type representation thereof,” he said. Though the re-enactment commemorates the 150th anniversary of the Maryland Campaign, it is scheduled for several days before the actual dates of the battles to encourage visitors to attend commemorative events at the respective battlefields on the actual anniversary dates, Anders said. The Battle of South Mountain was fought Sept. 14, 1862, for the possession of three mountain passes — Crampton’s, Turner’s and Fox’s Gaps — and resulted in about 6,000 casualties, Riford said. The Battle of Antietam, three days later on Sept. 17, was the bloodiest single-day battle in American history, with 23,110 casualties. Dan Spedden, superintendent of the South Mountain Recreation Area, announced at the same press conference Monday that the South Mountain State Battlefield’s sesquicentennial events will include the opening next spring of the battlefield’s first professionally designed museum exhibits. The exhibits will be in three buildings — the visitors center at Washington Monument State Park, and the hall and lodge at Gathland State Park — and will interpret the Battle of South Mountain, Boonsboro’s Washington Monument, and the life of reporter and Civil War correspondent George Alfred Townsend. The buildings that will house the exhibits are under renovation and will open in April, with a ribbon-cutting ceremony in May, Spedden said. South Mountain State Battlefield’s commemorative events will include tours, hikes and living history displays each weekend beginning in June 2012. On Sept. 14 and 15, 2012, the battlefield will have living-history and artillery demonstrations, hikes and real-time battlefield tours, he said. At Antietam National Battlefield, lectures and symposiums are scheduled throughout 2012, culminating Sept. 9 to 22 with speakers, tours, real-time hikes, Civil War-era music, a family activities tent, artillery and infantry demonstrations, and a Sept. 17 ceremony, said Ed Wenschhof, the battlefield’s acting superintendent. CWL: The Maryland, My Maryland website states that 1] reenactor registration opens in November, 2011 and 2] Confederate forces have re-branded themselves as States Rights Forces. Looking at #2 is kinda creepy. Does that mean that the boys in gray will re-write history and out flank Federal forces at the Sunken Road, similiar to what happened at the last Antietam reenactment five years ago? Why can't the Confederates just be Confederates? The Federals are still the Federals. Maybe the organizers couldn't get away with calling the Federal army the Abolitionist army? New and Noteworthy----Was The Fugitive Slave Law Repealed By Uncle Tom's Cabin? 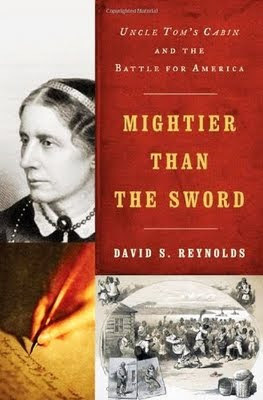 Mightier Than The Sword: Uncle Tom's Cabin and the Battle For America, David S. Reynolds, Norton Publishing, 351 pp., 43 b/w illustrations, notes, bibliography, index, 2011, $27.95. Before the Civil War Uncle Tom's Cabin: Life Among The Lowly was banned in the slave holding states and readers were jailed if found with a copy. In December 1862, Lincoln greeted the author "Is this the little woman who made this great war?" This remark may be a false memory written down three decades later by the author's relative but it reveals that maybe Uncle Tom's Cabin is better remembered as a provoking piece of literature than it is for plot and characters. Is the novel's reputation more important than its contents? Other novels, such as Jack Kerouac's One The Road  and poems such as Allen Ginsburg's Howl[ 1955] have had similar fate. People know enough about them to get the Jeopardy question right, but haven't read them. Starting with the June 5, 1851 issue, Uncle Tom's Cabin appeared as a weekly serial in theNational Era, an abolitionist newspaper. The serialized story, like Charles Dicken's serialized works, began to change hearts and minds from 'I don't care' to 'Maybe slave holding is wrong.' The book was published in 1852. It is estimated that each copy of Uncle Tom's Cabin before the Civil War had ten readers or listeners. At a time when reading aloud to the household was typical, each copy served an audience that discussed it immediately afterward. In this modern era it is difficult to read Uncle Tom's Cabin; CWL started it twice. The dialects were too thick to read either silently or aloud. The problem was solved by securing an audio book read by an professional reader. It worked not only for CWL but also for his children, who on more than one occasion refused to leave the car until a chapter was concluded. Mightier Than the Sword: Uncle Tom's Cabin and the Battle for America, is a biography of the life of a book in the context of 150 years of American literary, social, political, and entertainment history. David S. Reynolds knows this history well; his biographies of Walt Whitman and the notorious John Brown are fine examples that teach their readers as much about American culture as they do Whitman and Brown. Reynolds shows that Uncle Tom's Cabinwas central not only to the antebellum era but also from the Reconstruction era through today. The themes of fairness, family, and the empowerment of marginalized minorities are constant themes in American life and groups. The novel speaks to African-Americans, women, social and political protest movements that struggle within the confines of the American democratic republic. Reynolds offers interpretations of religion, reform, literature [both literary and pulp fiction] and theater. He examines two plot lines from the novel. The Northern one involves the escape of a slave family from Kentucky to Canada and the Southern one traces the painful separation of Tom, a slave, from his family when he is sold from Kentucky to Mississippi. For Reynolds, Stowe realistic human narrative had "a crystal clear social point: slavery was evil, and so were the political and economic institutions that supported it." [xii]. What made slavery wrong? For Stowe, the central issue was that slavery destroyed families. Uncle Tom's Cabin was immediately translated into European and other languages, including Russian and Chinese. Vladimir Lenin named it as his favorite book and cited it as an impetus for his revolutionary life. Mightier Than the Sword relates the path of the novel from the pen of Stowe, an emotionally and economically depressed mother living in Cincinnati, Ohio, through the modern Civil Rights Movement that denigrated Uncle Tom as a black, servile, master-pleasing character. Both Martin Luther King and Malcolm X were labeled Uncle Toms by African American radicals who pursued violent confrontations. 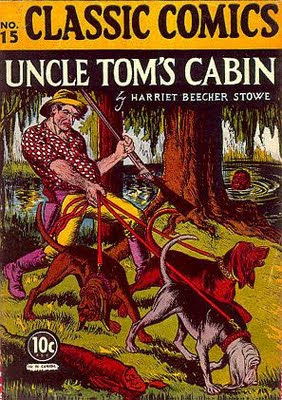 Uncle Tom's Cabin provoked Southerners to offer counter-fictions, the most successful of which came 40 years after the Civil War. Thomas Dixon was so enraged by a theatrical performance of Uncle Tom's Cabin that he wrote three novels. These novels were used as source documents for D.W. Griffith's film The Birth of A Nation. Reynolds merges this racist film with the Dunning school of thought regarding Reconstruction. The Dunning school believed that Reconstruction was the Dark Age of the South, one in which corrupt Carpetbaggers and Scalawags advanced illiterate, uncouth, lust-filled blacks into political power. The school understood the violent response of the Ku Klux Klan as noble and necessary. Was the Fugitive Slave Law repealed by Uncle Tom's Cabin? Reynolds leave little doubt that the novel did indeed convert many Northerners who didn't worry about slavery to a position in which worry and then resistance was an acceptable response to the extension of slavery in the western territories. During the Victorian era, the idea of 'family' was foundational to society. Uncle Tom's Cabin showed that slavery was an assault on the ideal of family. It is not necessary to have read Uncle Tom's Cabin before reading Mightier Than The Sword. Reading or listening to Uncle Tom's Cabin after reading Mightier Than The Sword would be true to the goal of a liberal arts education. Living history presenters would be well served by addressing Mightier Than The Sword. Quite likely the historical person whom the presenter is portraying read Uncle Tom's Cabin and, whether a Northerner or Southerner, it challenged them. Caption: Simon Legree on the cover of the comic book adaptation of Uncle Tom's Cabin (Classic Comics #15, November 1943 issue). 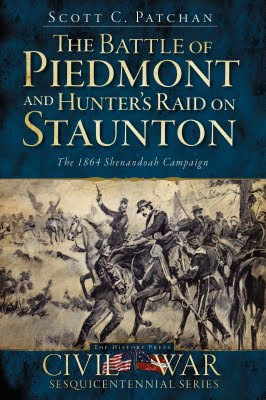 The Battle of Piedmont and Hunter's Raid on Staunton: The 1864 Shenandoah Campaign, Scott C. Patchan, The History Press, 191 pp., notes, bibliography, index, 28 b/w illustrations, 15 maps, 2011, $21.99. Studying the Civil War, readers come to realize that small military events change large military events. Speculative history, like The Fourth Battle of Winchester: Toward a New Civil War Paradigm by Richard M. McMurry, offers counterfactual questions that are kept within the parameters of what was possible at the time and place. These types of questions aid in gaining a better understanding of past events. The apparently minor engagement fought June 5, 1864 near the village of Piedmont, Augusta County, Virginia is such a battle. Patchan's The Battle of Piedmont does this. He doesn't speculate but does show the battle was an important gate hinge upon which the war in the Eastern Theater swung open to a different set of circumstances and directions. On June 5 Union Major General David Hunter engaged Confederates under Brigadier General William E. "Grumble" Jones north of Piedmont. After severe fighting during which Jones was killed, the Confederates were routed. Hunter occupied Staunton on June 6 and soon began to advance on Lynchburg, destroying military stores and public property in his wake. The Union victory at Piedmont took off the map the only Rebel force available for offering resistance to destruction in the Shenandoah Valley. Davis and Lee were forced to find troops to send to the region. Within a few days Confederate troops under Jubal Early were sent to the valley and another Shenandoah Campaign ensued, one that would lead to the battles of Monocacy, Fisher's Hill and Cedar Creek and would become become one of the two famous Shenandoah Valley campaigns. If Hunter hadn't won at Piedmont but had lost like Siegel at New Market, then Early's troops may have stayed with the Army of Northern Virginia. Strengths of Patchan's work, and The History Press's Civil War Sesquicentennial series, is the focus on biography and personalities. Less familiar with readers maybe generals David Hunter, John Imboden, William Jones, medal of honor winner Julius Stahel, captain and master artillerist Henry DuPont, colonels Joseph Thoburn, William Tibbets, and Thomas Wildes. 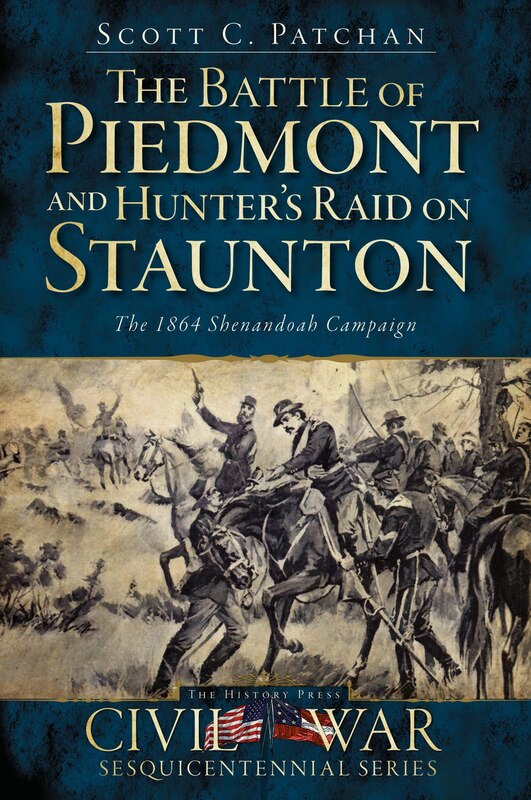 Each is crucial to the outcome of the Battle of Piedmont and the raid on Staunton. Within the limits of pages available, Patchan offers a great deal of command, control and combat episodes and stories. The front line soldiers speak throughout. In Chapter Seven, "I Never Want To See Such A Sight Again", the voices from the 18th Connecticut, 28th Ohio, 45th Virginia are heard as the wounded and dead are recovered from the field. Hopefully, History Press will soon offer The Sacking and Battle of Lynchburg as a title in its Civil War Sesquicentennial Series. After Staunton, Hunter moved southward up the Valley to Lexington, where he burned VMI on June 11. His troops freely looted civilian property as well. Hunter's men plundered a number of private homes and burned the home of former Governor John Letcher and destroyed the library of Washington College. Hunter was defeated by Early at the Battle of Lynchburg on June 19. Once in awhile Patchan will offer a phrase or word in quotes that were not spoken or written by another person. Examples are "Valley of Humiliation", "corked", and "Lost Cause". The quotation marks are unnecessary and are a minor distraction. Quotation marks for "Beast" Butler, "Black Dave" Hunter and "Grumble" Jones are acceptable. The book's maps are clear and easy to understand though topographic lines are not shown. Overall, CWL looks forward to adding Patchen's Shenandoah Summer: The 1864 Valley Campaign  to the reading list. His July 2011 Second Manassas: Longstreet's Attack and the Struggle for Chinn Ridge is already on the personal book shelf and the next book to be read. In response to this review, Joanne Shelby, a CWL friend sent this note: "The book Heroines of Dixie by Katherine Jones has the letter from Henrietta Bedinger Lee to General David Hunter regarding the burning of her home. Quite a moving letter." 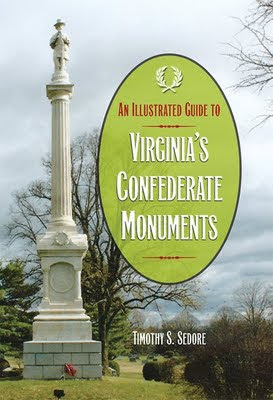 An Illustrated Guide To Virginia's Confederate Monuments, Timothy S. Sedore, Southern Illinois University Press, 360 b/w photographs, six maps, 310 pp., appendix, index, $39.95. Probably no state bore the brunt of the Civil War more than Virginia. Its communities and farmsteads, railroads and industries certainly were in the path of the war. The state bears a myriad of testaments to its losses. Timothy S. Sedore offers a guide to Virginia's Confederate monuments that helps readers and researchers to comprehend Virginia's sacrifices. With An Illustrated Guide to Virginia's Confederate Monuments, Timothy S. Sedore presents volume that enumerates by region Virginia's Civil War memorials. Sedore's guide catalogs 360 of the state's famous and obscure commemorations. It provides both a compilation of their sites and a compelling vision of the public sense of Virginia's loss. Sedore geographically sorts the memorials by region: The Shenandoah Valley/Northwest Virginia, Southwest Virginia, Richmond/Northern Virginia/The Piedmont,The Northern Neck/Middle Peninsula/Eastern Shore/Eastern Southside, Petersburg/Southside west of Petersburg/Central Virginia west of Richmond. He then sorts by county a then by city/borough/community. Each region has its own map with county borders shown. The entry number for each memorial is listed for each county that appears on the map. This arrangement easy access to the material any where in the book. Thus organized, the book is open to the casual reader, the county historian, or the community event organizer. The familiar battles such as Manassas, Winchester, Fredericksburg are easily found as are the lesser-known locations such as Rude's Hill, Cedar Mountain, and Trevilians. Sedore offers 360 entries that include: the entry number, name of the group or individual honored,location,date of erection, medium [such as granite], the inscription, a paragraph of explanation and a black and white photograph. Tablets, statutes and monoliths located on courthouses lawns, cemeteries, town squares,and battlefields are cataloged. Readers may view An Illustrated Guide to Virginia's Confederate Monuments as a photographic catalog, a tourist's guidebook, or researcher's compendium. It is all of those. Sedore's field research reveals these sites to be both monuments of remembrance and as public efforts to reconcile mourning with Southern ideologies during the postwar era in, what Drew Gilpin Faust has called, a republic of suffering. The memorials that are both intimate and aloof. Sedore analyzes in depth the nature of these attempts to publicly explain Virginia's sense of grief after the war. He notes that the use of the term 'Civil War' is uncommon. The phrase 'War Between the States' was the preferred expression. An Illustrated Guide to Virginia's Confederate Monuments will appeal to the travelers, historians, and armchair enthusiasts. Sedore's fine Introduction covers three eras: 1861 to 1889[Bereavement and Funeral Era], 1890 to 1920 [Reconciliation and Celebration Era], and 1920-today [Commemorative Era]. He notes the commonalities of inscriptions, designs, and ceremonies for the eras. Sedore finds that there are no explicit mention of slavery on Virginia's monuments and that racial dominance is a principle theme. Sedore also leaves out tombstones though public shrines are included. Sedore's net is broad though. Southern born and Northern raised, Sedore is aware that the history behind these monuments is sometimes contentious and provocative. He has chosen not to address these issues in this book. Sedore offers a list of what is not in the book: highways' historical markers, the Jefferson Davis Highway markers, the Civil War Preservation Trust's markers and Virginia Civil War Trails markers. Tributes to war horses are excluded. Plaques and iron markers describing the campaigns around Richmond are not in the book because they are essentially narrative guides. Sedore achieves his goal. His work is among the finest illustrated guides to Confederate monuments. 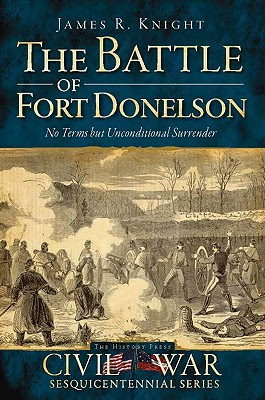 The Battle of Fort Donelson: No Terms But Unconditional Surrender, James R. Knight, The History Press, 158 pp, 51 photographs, 8 maps, index, notes, appendices, 2011, $19.99. Though the title features Fort Donelson, Knight's work offers so much more. The rise of the Union's brown water navy, the Confederate's of dilemma protecting the Trans-Appalachian region that is bisected by three rivers, and the strategic decisions led to lasting failures and successes are covered in The Battle of Fort Donelson: No Terms But Unconditional Surrender. Professional competencies, geographic terrain, and regional politics are reviewed and set with the context of early 1862 during the Civil War. Succinctly, Knight covers the pasts, 1861-1862 war activities and post events in a host of decision makers. The stories of 14 military leaders who won and lost at Fort Donelson enliven the story of the campaign. The Battle of Fort Henry, fought on February 6, 1862 on the Kentucky-Tennessee border, was the first major victory for the Union and Ulysses S. Grant in the Western Theater. Hand in hand with the new brown water navy, On February 4 and February 5, Grant landed two divisions just north of Fort Henry on the Tennessee River. While it was being simultaneously attacked by USN timberclad and ironclad gunboats commanded by Flag Officer Andrew Hull Foote, Grant's troops began their assault on the fort. Due to Kentucky's neutrality, the fort was poorly situated across the border in Tennessee. Naval gunfire and rising river waters, caused Fort Henry's commander, Brig. Gen. Lloyd Tilghman, to surrender to Foote before the infantry arrived. Knight recounts how the surrender of Fort Henry opened for Federal ships the Tennessee River to past the Alabama border. From February 6 through February 12, raiding timberclad vessels destroyed Confederate shipping and railroad bridges as Grant's army marched overland 12 miles to Fort Donelson. The battle at Fort Donelson was haltingly fought from February 11 to February 16, 1862. On February 14, USN timberclad and ironclad gunboats attempted to reduce the fort with naval gunfire, but sustained significant damage from Donelson's water batteries. On February 15, with their fort nearly surrounded by the Union army on the west and the Cumberland River on the east, the Confederates launched a dawn attack against Grant's army. The attempt was to open an avenue of escape. Due the indecisiveness of the Rebel generals and Grant's decisiveness in rallying his army and forging a counterattack, the escape route that was open for several hours, became closed. On the morning of February 16, two Confederate generals past the situation to a third who agreed to unconditional surrender terms from Grant. Knight sets the campaign well within the contingencies of the situation. Personalities play as large a part in the campaign as do the strategic, tactical, geographic and weather constraints. Within 135 pages, Knight offers an insightful description of a campaign that in many ways set the tone of the Union's victory in the war. Marshaling resources, building leadership, devising amphibious operations, and overcoming its own deficits the Union won the war. Well paced, exciting and even at times suspenseful The Battle of Fort Donelson: No Terms But Unconditional Surrender is a fine addition to The History Press' fine Civil War Sesquecentennial Series. 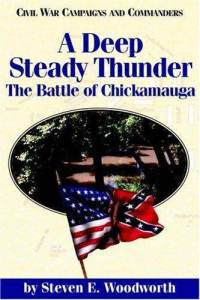 A Deep and Steady Thunder: The Battle of Chickamaugua, Steven E. Woodworth, McWhiney Foundation Press,134 pp., order of battle, bibliography, index, 1996 and 2006,$11.95. Steven Woodworth does a fine job of explaining one of the Civil War's most tactically complex battles. The Battle of Chickamauga, which was fought September 18-20 1863 fought, northern Georgia's dark forests with few farm clearings, includes a multitude of intentional and unintentional flanking attacks ordered by confused commanders with limited tactical control. It was a battle fought largely by brigades, regimental and company commanders. Chickamauga, though as important as Gettysburg, has not generated the wealth of campaign and battle studies. Glenn Tucker's Chickamauga, published during the Civil War centennial and Peter Cozzen's 1992 This Terrible Sound are the only two notable campaign and battle studies. Woodworth has nicely crafted a concise, clear narrative for readers who are approaching the battle for the first or second time. Containing 21 short biographical descriptions and 13 maps, A Deep Steady Thunder moves from general staff to regimental levels in a quick fashion. Woodworth is direct in his criticism of Confederate commanders resistance to Bragg's sound and appropriate plans and Rosercans exhaustion induced confusion that is reminiscent of Jackson's Seven Days on the Peninsula in 1862. Woodworth's description of Longstreet as being arrogant, self-promoting and envious of Bragg's position seems to be a bit over the top. Another book from the McWhiney Press offers a heavy handed demolition of Longstreet during the Chickamauga, Chattanooga and Knoxville campaigns of 1863. The strength of Woodworth's effort is his handling of the command decisions which limited the Confederate's successes and brought about the Federals defeat. As divisions, brigades and regiments move back and forth through the wilderness and cornfields confusion sometimes reigns. Fortunately, Woodworth has sorted through a multitude of assaults, retreats, and counter-attacks to provide a clear and even suspenseful accounting of plans gone awry. Rosecran's movement of brigades that led to gaps in the Federal line on the 20th are clearly described. The important arrivals of Longstreet's Confederate corps and Granger's Federal reserve division are nicely described and their importance to the outcome of the battle is well developed by Woodworth. Within the limits of 100 pages, Woodworth offers tight and thorough introduction to the Battle of Chickamauga; for those who are visiting for the first time the battlefield it is a fine place to start. For the armchair reader who is unfamiliar with the 'Gettysburg of the West' A Deep Steady Thunder offers good introduction. The Battle of Brandy Station: North America's Largest Cavalry Battle, Eric J. Wittenberg, Steven Stanley [maps], History Press, 272 pp., 57 illustrations and photographs, 12 maps, notes, bibliography, guided tour, order of battle, paperback, $24.95. Fought on June 9, 1863, the Battle of Brandy Station, Virginia was the largest predominantly cavalry engagement of the American Civil War. Many Civil War enthusiasts regard the battle as solely a cavalry fight but there were eleven Union regiments engaged. Also, though many view it as the beginning of the Pennsylvania Campaign, it may also be seen as the conclusion of the Chancellorsville campaign. Wittenberg's effort would have been strengthened by noting the Union cavalry's raid that began April 27, before the Battle of Chancellorsville. He does develop a picture of the Federal cavalry's growing aggressiveness by covering the purge of Rebel guerrillas from the Northern Neck region between the Rappahannock and Potomac Rivers in mid-May. One of the several delights of Wittenberg's The Battle of Brandy Station is his handling of primary sources of the combatants. There are about 100 indented and italicized comments from the soldiers. The voices of the soldiers are heard throughout the narrative. Wittenberg takes a non-partisan stance towards the sides; both criticism and compliments fall on Blue and Gray. Stuart's three grand reviews and sham battles [May 22, June 4 and June 5] are not overweighted against him. But for Wittenberg , more illustrative are Stuart's over wrought responses to the Richmond press' reports that hold him accountable after the battle. The author does not advance speculations about the press editorials and Stuart's decision to ride around the Union army in late June and early July. Also, Wittenberg organizes his work into chapters that are not focused on the clock but focused on the brigades' and divisions' engagements. The divisions with their brigades and regiments are well developed and the are not diminished by overcrowding pages and chapters with everything that was going on at a particular hour of the battle. Of the 14 chapters, eight are devoted to specific segments of the battle though other fighting was going on at the same time. This helps with the continuity within the day long engagement between nine Federal brigades[seven cavalry and two infantry] and five Confederate brigades. In a minor but helpful decision, The History Press' Civil War Sesquicentennial Series places the portraits in the text where the first mention of the soldier occurs. Often times, inserting all the portraits in the center and on glossy paper, is a nuisance and minimizes the effectiveness of the illustrations. The maps in The Battle of Brandy Station contain topographic features and elevation lines. Missing is a map that shows the entire battlefield. An additional and enjoyable feature is the Epilogue that tells the story of two Federals who were detained as prisoners captured at Brandy Station and were sent to Richmond's Libby Prison. Of the many prisoners from the battle these two were chosen to be executed in retaliation for the execution of two Confederate spies quartered at Johnson's Island prison near Sandusky, Ohio. The story is a highlight that reveals the state of prisons and paroles in 1863. 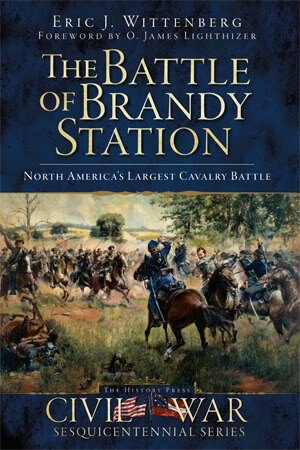 The analysis of the Battle of Brandy Station and the Walking and Driving Tour of the attle are clear and concise. Overall, readers are well served by Wittenberg's The Battle of Brandy Station and the History Press' Civil War Sesquicentennial Series.